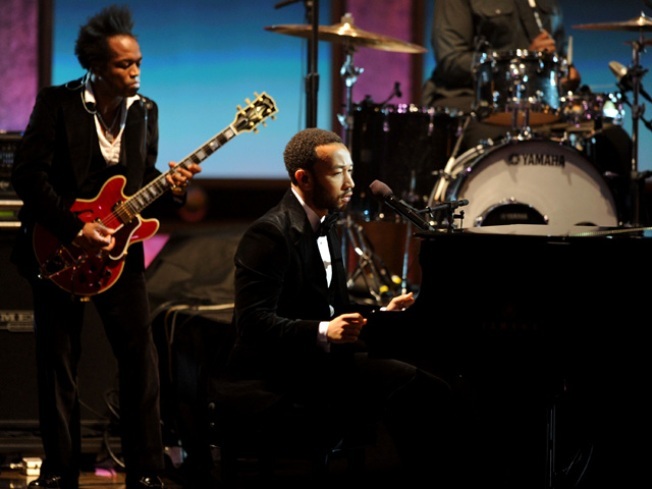 "Do The Right Thing" director won't do "8 million close-ups"
Musician John Legend performs onstage with the Roots during the 41st NAACP Image awards held at The Shrine Auditorium on February 26, 2010 in Los Angeles, California. Spike Lee will direct a live webcast of a concert featuring John Legend and the Roots. The concert, to be held in New York on Sept. 23, is the second part of "Unstaged," a live concert series presented by American Express. The first was an Arcade Fire concert, whose webcast in August from Madison Square Garden was directed by Terry Gilliam. The live stream will be webcast on YouTube, via the music video website Vevo. Various interactive elements will also be offered, including an option for viewers to select their camera view. "It's not necessarily a Spike Lee joint," Lee said. "It's a John Legend and the Roots joint." Lee most recently released his second New Orleans documentary, "If God is Willing and da Creek Don't Rise," but several of his recent films have focused on live performance. "Kobe Doin' Work" documented Kobe Bryant in a single NBA game, and "Passing Strange" filmed the Broadway musical. "I like doing stuff live," Lee said. "Especially with someone like Kobe. I can't stop the game. You got to be ready for almost anything. We can't stop this concert, either. Going to have to go with the flow." Lee has also previously documented performances by John Leguizamo, Luciano Pavarotti and the comedians of "The Original Kings of Comedy." "It's not about my stamp," says Lee. "You want to see the stamp of John Leguizamo, you want to see the stamp of Stew with 'Passing Strangers,' the stamp of Pavarotti. I'm just there to help facilitate that." American Express is planning three more concerts for "Unstaged" later this year, but hasn't yet announced those acts. Legend and the Roots will be performing two days after the release of their album "Wake Up!" Lee acknowledges he's never watched a concert online, but says he'll do his "due diligence" before the show. One thing he's not planning to do is shoot "8 million close-ups," which he says is the tendency in television. "I'll tell you this: I'm not shooting for people to look at on their iPhones," the director said. "At least a 15-inch computer screen. For me, it's criminal to watch a movie on your phone."